miahallen looks at a midrange Sandy Bridge motherboard from Gigabyte. 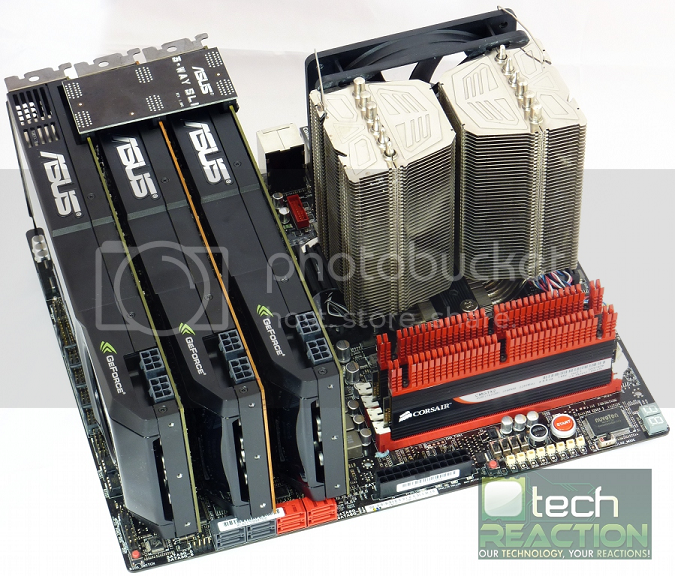 The two top�motherboards�for the�Sandy Bridge platform�on release day were the Asus Maximus IV Extreme (or "MIVE" for short) and the Gigabyte P67A-UD7...miahallen�investigates the pair, and declares one of them the victor! If you haven�t already seen our complete Asus Maximus IV Extreme (MIVE) motherboard review, Parts ONE and TWO, you�re missing out. Part 1 covered synthetic testing with the i7 2600K CPU at 5.1GHz to give an idea of the power that this platform contains. Part 2 was a full blown comparison between X58 and Sandy Bridge, with a helping of AMD Thuban for good measure. We also awarded the MIVE the TechREACTION.net Gold Silicon award for its outstanding performance. 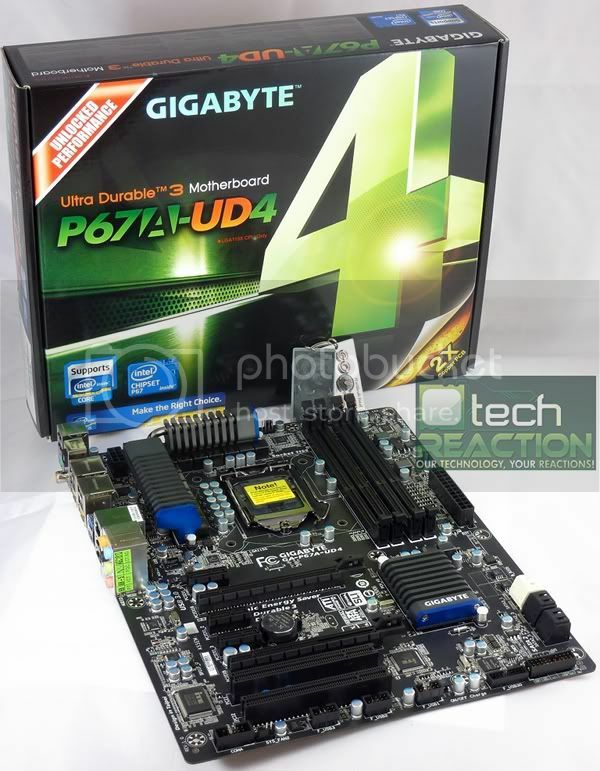 Today, we�ll give you a look at another top P67 choice; the Gigabyte P67A-UD7. Currently it is the top choice for Sandy Bridge users looking for Gigabyte flavor in their builds. This will be a true head-to-head comparison between the two motherboards� performance, overclocking, and ease of use factors. All of these things are important for enthusiasts in this market, so with luck, Gigabyte will meet and exceed our expectations in regards to these features with the UD7. 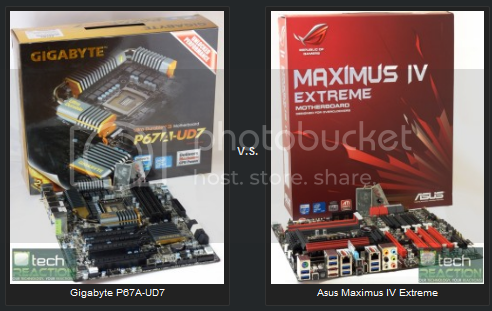 Gigabyte P67A-UD7 VS ASUS Maximus IV Extreme � Battle of the Titans! 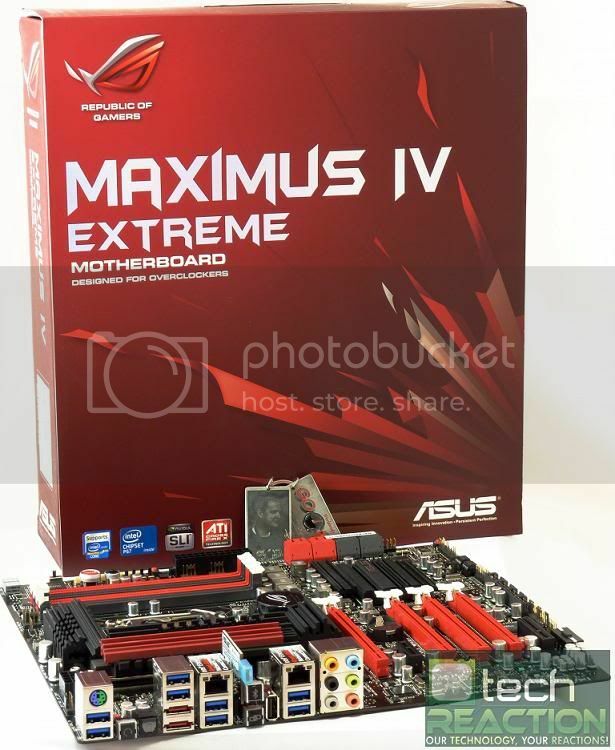 "In this review, I�ve dug much deeper into the Maximus IV Extreme and exploited its full potential with single, dual, and triple SLI configurations.� I�ve included a much more thorough testing regime to better gauge the real world performance potential in this platform, and drawn full conclusions to better help you with your buying decisions.� So is Sandy Bridge right for you?� Do you need a Maximus IV Extreme?� These are all good questions, read on for the answers." "My subject today is the new Asus Maximus IV Extreme, a Republic of Gamers (�ROG�) branded model which represents the top-end of the P67 offerings from Asus.� As always, they�ve managed to pack an overwhelming number of technologies and features into this product and it�s my goal to give you honest feedback based on my experience." 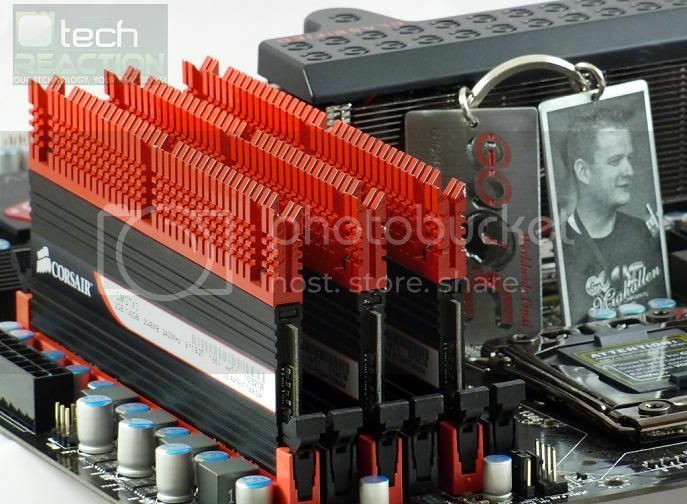 MIAHALLEN first wrote an general Intel Core i3, i5, i7 overclocking guide this past January that was posted at overclockers.com.� It has recieved a lot of attention in the enthusiast community and has alread had over 100K unique page hits.� After recieving a lot of feedback, he made a major revision in Febuary, but it still was not perfect.� So over the month of August, MIAHALLEN spent many hours drilling down to the core, and rewriting the guide, breaking it down into three more specific lessons on the particulars of overclocking Clarkdale, Lynnfield, and Bloomfield/Gulftwon based CPUs.� Again, the new guides have bee recieved by the community, and have proved very popular.� If you have not had a chance to read through them yet, and you'd like to learn more about overclocking these platforms, please stop by TechREACTION and check them out. MIAHALLEN is sitting at the front door of the Top 10 best overclockers on HWBOT.� He has moved up 31 spots this month, and 10 spots this week.� �As of today, he has taken over the 11th spot, and only a couple of points from breaking into the top 10.� GOOC 2010 Japan qualifier is now closed.� The unofficial results places him in 2nd place.� Way to go MIAH.